Great report, Jamos! Thanks for posting. Looking forward to A Day. 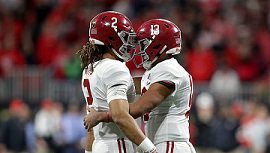 Glad to hear Tua was in the scrimmage. His thumb must be ok. Should draw a good crowd with Jalen and Tua both playing, plus all the new faces in key positions. Excellent, Jamos. You are great at capturing the salient points. I didn't notice any big time injuries today and that is always good. Thanks to you both (as well as the bugs who control injuries). Thanks Jamos for real. Man you and hscoach make reading your reports so much fun. RTR! Jamos, do you mind if I post this over on WoollyAl for the Bama fans over there to read? I will explain where it came from. You may have to spice it up a bit, add a few misspellings, and trash the QBs before the Woolly crowd can understand the Jamos genre.